Despite having to do laundry and mop the basement floor yesterday, I managed to finish my linen iPad case. I used Co-Co-Chi E Style fabric by Kokka, Japan and Robert Kaufman’s Quilter’s Linen in Grey and decided to keep the zippered flap on the front adding a simple band to hold it closed and a coordinating zipper pull. The pocket is big enough to fit my stylus and iPhone. There are 2 layers of cotton batting quilted onto the front and the back of the case for protection and is snug enough that my iPad can easily slip in and out but doesn’t move around. For a bit of fun and surprise,I used Tufted Tweets in purple for the lining. Will take and post photos of the lining and back this afternoon. Linking up to Sew Happy Geek’s Manic Monday Link Party! Also linking up to TGIFFriday! 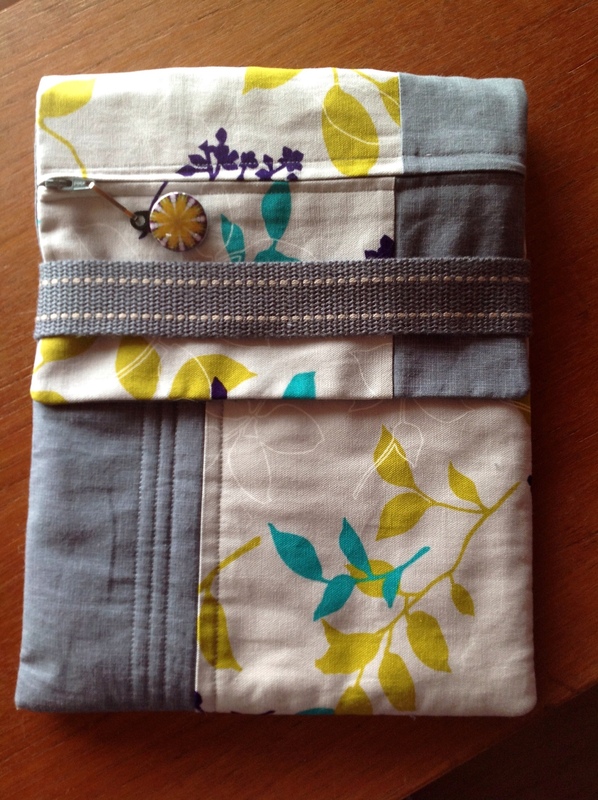 This entry was posted in iPad and tagged Linen, Manic Monday, Sew Happy Geek by Tabatha. Bookmark the permalink. Beautiful fabrics! Love the print combined with the muted neutral. It’s lovely, love the fabrics you’ve used. Thanks for stopping by and commenting! I love the Japanese linen too, it has a very rich feel to it, not quite home dec. but definately heavier than quilting cotton. Thanks M-R, I really love what you’ve been up to as well! Very nice work. Love the color combo! Take care. Deb. Thanks Deborah, it’s a somewhat unique colour combination, one I wouldn’t have thought of on my own. Fabric is so inspiring! Thanks Ashlea, for taking the time to comment. I think the iPod case is cute without being too cutesy. Thanks Ashlea, great job on the free motion quilting! I had to drop out, not enough time! Thanks Michelle, I’ve had this fabric in my stash for awhile now, just waiting for the perfect project and I still have enough left over to make another! Great looking iPad sleeve, Tabatha! Thanks P! Did you see it was featured in Craftsy’s weekly Newsletter?! I love your zakka style pouch – so it fits an ipod and an ipad as well? Are you tking part in the ‘Zakka Sew Along’ starting next week? info at http://lrstitched.com/ I just got the book and are keen to make a few items. Thanks for linking up to TGIFF nice to have a 2nd linky. I am going to follow along with the Zakka sew-along but I just don’t have the spare time to sew along, sadly, but I did buy the book, it’s supposed to arrive today!! I’ positive there will be a few projects I’ll be making from the book. Cheers and thanks for taking the time to comment! I’m such a knob! I didn’t realize what “Zakka Style” was until I received my copy of the book on Friday! LOL! Will you forgive me? Thanks Janine, glad you stopped by! Thanks Janine! I’ve added you to my Google reader, I love your Drunkard’s Path Mini!! Ooooooo I love it! I’m a sucker for Apple, Japanese prints, grey & purple. LOL! Did you use a pattern or wing it? And how does the strap close? Velcro or snap or? You did a great job on this! Thanks Johnnybug! I winged this after trying out a written pattern that was waaaay too big, even for my new iPad which is a little thicker than the old. The flap simply slides under the strap, no velcro or snap, I didn’t want anything that could scratch the iPad. The iPad doesn’t slip out, it’s for protection purposes if you want to throw it in your bag with a bunch of other stuff. ok, i give up. where are the instructions? Where can I find the pattern for the Ipad sleeve? Hi Laverne, I’m working on a tutorial and hope to have it up by next Sunday! Thanks for asking and stopping by to check it out!